What is OFM (Optimized Fat Metabolism)? >> What is OFM (Optimized Fat Metabolism)? OFM stands for Optimized Fat Metabolism . OFM essentially resets the body back to burning “fat as fuel” for most of the aerobic spectrum, because your body prefers to metabolize fat at high aerobic rates, rates much higher than the current science says is possible, but consistent with the emerging science on fat adaptation. Once an athlete is adapted, OFM actually enhances strategic carbohydrate use, so now carbohydrates work like they never worked before, by using less. OFM (Optimized Fat Metabolism) was created & developed for VESPA athletes to consistently obtain the “game-changing” performance and health benefits of using VESPA and getting the body back to its natural state of using “fat as your fuel” for aerobic metabolism. OFM is an integrated, multi-faceted approach to help the athlete make that fundamental shift back to burning “fat as fuel” for aerobic metabolism, even at higher aerobic levels. Emerging science from the FASTER Study is confirming what VESPA athletes already know; that fat metabolism plays a much larger role than previously thought possible and actually helps make carbohydrates use more powerful and sustainable. OFM is not a “one size fits all” structured program. OFM empowers the athlete with the information, scientific basis, and real world application so each athlete can integrate OFM into their daily life by making achievable changes based upon each athlete’s unique situation. Feasibility & Metabolic Flexibility: It’s a LOT easier than most people think! OFM is based on biological & evolutionary scientific principles and physiology, not upon today’s media driven “sound-bite” science. Many aspects of OFM are initially counter-intuitive and contradict the simplistic “group-think” mentality regarding fat , health and performance, yet deliver real world results for athletes of all ages and abilities across sports. OFM is an outgrowth of VESPA’s commitment to our customers. Simply put, the human body is designed to perform optimally using “fat as your fuel” for aerobic performance. This is why humans carry large stores of fat and very limited stores of glycogen. Look in the mirror and you will see…. .why not optimize utilization of “fat as fuel”? Even the leanest athlete carries more than enough “on-board” fat calories to run a 100 miles, cycle a double century or complete an Ironman. Think of it this way; fat is your aerobic energy source and glycogen/glucose is your “fight or flight” fuel. So, unless your event is the 100 meter dash or Olympic powerlifting, focusing on optimizing fat metabolism via OFM needs to be a fundamental part of your program. Science begins with Observational Evidence. VESPA was developed after observing the incredible performance of the Asian Mandarin Wasp, vespa mandarinia. This predatory wasp performed its daily feat of incredible strength & endurance primarily utilizing the fat stored in its thorax catalyzed by the peptide fed to it from the larvae. This naturally-occurring peptide is a key ingredient (wasp extract) of VESPA. Since VESPA’s inception, athletes using VESPA have won competitions and set World Records at the very highest levels of competition in sports, ranging from the Olympic Marathon to Figure Skating. However, the connection was never made with consumers pursuing athletic endeavors because “experts” and sports physiology textbooks have been telling us to avoid fat, fat makes us fat and that fat can only serve as a fuel for low intensity to mid-level intensity metabolism in athletes. In the past seven years, the ultra-endurance sports have seen record-shattering wins and performances by athletes using VESPA and its OFM program. These out-sized performances are consistent and not one time performances. Not only are elite ultra-endurance athletes enjoying the benefits of VESPA and OFM, but many older age-group athletes are consistently performing at levels many would not considered possible for humans of any age! While VESPA has retained a dedicated following most athletes cannot wrap themselves around the premise of fat-fueled performance because of the carbohydrate centric, fat phobic group-think. In spite of these winning performances, there exists a psychological disconnect because VESPA’s fat driven approach defies what most people have been led to believe. What about Carbohydrates? OFM does NOT eliminate concentrated sources of carbohydrates from the diet or fueling, rather uses them “strategically”. VESPA plays a critical role to keep the athlete “locked-in” a high level of fat-metabolism while still being able to utilize carbohydrates. Clearly, carbohydrates are a super quick burning energy source providing the kind of energy necessary for quick intense bursts and surges in athletic performance. The physiology, peer-reviewed literature, podium and athlete feedback all support the use of carbohydrates. The problem is the “unintended consequences” of over-consumption of concentrated sources of carbohydrates which, over time, create a host of performance and health deteriorating issues. OFM is not a no/low carb ketogenic protocol. OFM is a program to get the maximum efficiency and performance from the athlete’s aerobic potential via lipolytic pathways (i.e. Lipids/Fat) to build greater physiological capacity to sustainably utilize glycolytic pathways (i.e. carbohydrates) at the upper end of aerobic spectrum and into the anaerobic spectrum. 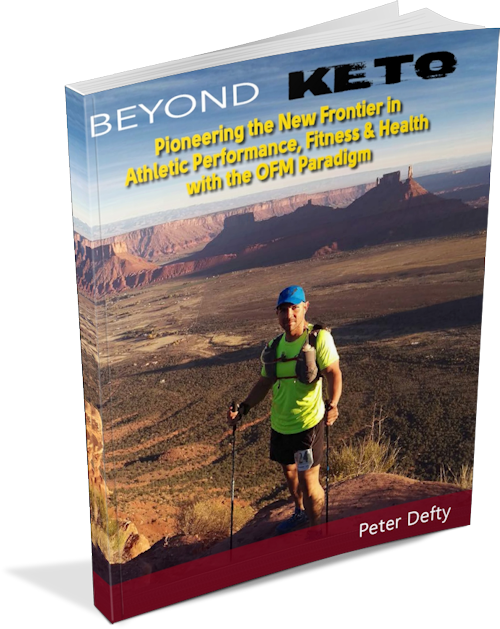 While there are times and periods where carbohydrates will be severely restricted, our experience is that with most athletes, once they are fat-adapted, the dietary aspects of OFM actually become very simple and easy. Based upon athlete feedback and performance, the OFM “strategic” use of carbs allows this quick burning energy source to have a stronger, more sustainable impact on performance by using significantly less. Seven years ago, VESPA began an aggressive support and development effort to gain consistent, measurable performance benefits after polling athletes who were new to using VESPA. Some athletes noticed results, others nothing, while a few said VESPA yielded stomach issues. Even more interesting was that some athletes said they noticed great performance one time then not another. Over these seven years, VESPA developed OFM to yield the consistent out-sized performance, recovery and health benefits from using VESPA. Today, a small but growing number of mostly ultra-endurance athletes are enjoying the “game-changing” benefits in performance, recovery, and overall health provided by OFM. This has resulted in SUCCESS. There was a time when most people were led to believe the world was flat and the sun revolved around the earth. Think about this for a minute. People really believed these “facts” to be true, when they were patently wrong! Now step back from what you have been led to believe about sports nutrition, physiology and, most of all, your health; that carbohydrates are the end-all for performance, but most important of all, to the absolute terror you and most people have regarding fat. If you know of, heard from, or read/heard an interview/podcast by an athlete who has enjoyed SUCCESS through VESPA/OFM, what they are experiencing may sound too good to be true. Consider these doubts may be driven from a mindset and perspective based upon a “flat-earth” perspective. The cutting-edge often sounds implausible and is roundly dismissed when it starts to have success because it defies very deeply embedded belief systems. The term for this is Cognitive Dissonance. Now take a look around at world health and even the “health” of many athletes who are experiencing energy stability issues including bonking, gastrointestinal issues, re-occurring injuries, slow recovery and declining performance. Maybe this is you. Ask yourself; do you want to be carb-addicted or fat-adapted? Maybe there is a better way: The OFM way. The OFM Pyramid is a VESPA developed tool so the athlete can understand the complex, highly inter-related aspects of the OFM Program in an intuitive way which allows each athlete to create their own personalized OFM program around their individual needs and situation rather than force them into a “one size fits all” program. This not only achieves results but makes the OFM program feasible on a long-term sustainable level. When an athlete achieves “The Zen of OFM,” OFM becomes effortless and intuitive because not only has the body made the physiological shifts, but the behavioral changes that foster consistent optimal performance and health. The OFM Pyramid is broken down into 7 fundamental elements, which combine to form the OFM Program. Each element is broken down further into related sub-sections. Every sub-section is intricately interwoven with the others and important in gaining your VESPA fueled performance potential. The pinnacle is OFM, what we term “The Zen of OFM.” However, it is first necessary to start with a solid foundation, the “Fat-Adapted” Metabolic State.